In 2016, a new indoor festival was born. 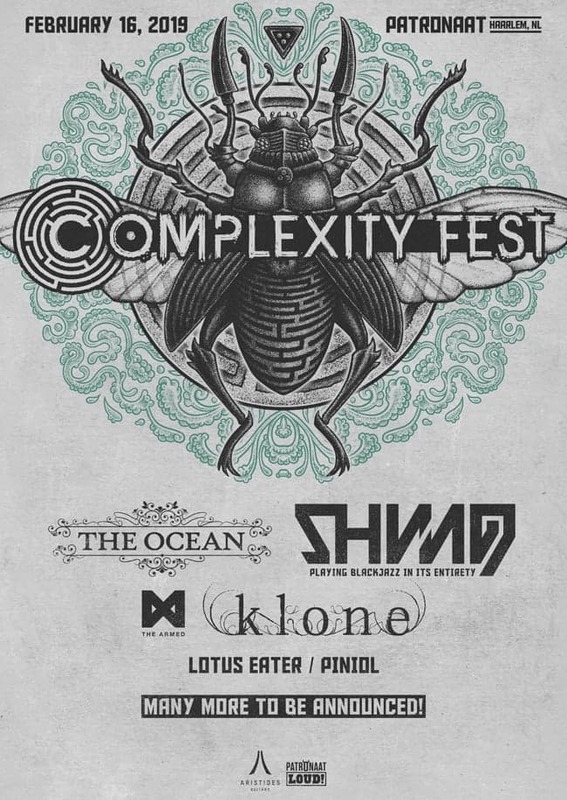 Complexity Fest takes place in the city of Haarlem, Netherlands, close to Amsterdam. Among the bands that played there so far are SikTh, The Faceless, Ihsahn, Obscura, VOLA and Agent Fresco. I was fortunate enough to attend the event for the very first time this year; now the date for 2019 is fixed, and so are the very first six bands! It looks like Complexity will return to being a single-day event. Mark your calendars, because it will all happen on Saturday, February 16. In 2016 the festival added another half day to the ‘whole festival day’, so maybe we won’t get to see that many bands, but what we already got sounds amazing! One of the assumed headliners for sure is The Ocean. The Swiss/German-post metal outfit is just about to release their new record Phanerozoic I: Palaeozoic, and teased it with a new song called “Permian: The Great Dying” (more in this here). Another highlight will be Shining‘s (NOR) performance. The band recently announced a new album and sound change. Think of “Animal” what you want, but Shining will perform their outstanding album Blackjazz in full! The Armed from Detroit are lined up next to French prog metallers in Klone. 2018’s prog highlight PinioL and Glasgow’s Lotus Eater complete this very first update. Complexity takes place at Patronaat, Haarlem, which easily is one of my favorite venues. It’s an old cinema that was remodeled into three venues. That means you’ll be on heavy rotation trying to catch all the great bands at the festival! The location being close to Amsterdam makes it easy to travel, and the city is lovely as well. Tickets are on sale now and quite cheap. Better book your travels and tickets soon, you probably won’t regret doing so. Attend the official Facebook event and like the festival’s page to not miss any updates! Next PostIrreversible Mechanism - "Immersion"